In 1958 Sims played with Benny Goodman at Expo ‘58 in Brussels, where he met the Viennese-born Hans Koller, then Europe’s coolest tenor sax. Two years earlier Sims had made a Blue Note recording with the German pianist Jutta Hipp and he was keen to meet other European jazz musicians. So Jo Berendt, head of the jazz department at the then SWF, invited the two to a studio concert, supplementing the horn section with Adi Feuerstein and Gerd Husemann (fl, ts), Willie Dennis (tb) and Helmut Brandt (bs). ; The ensemble also featured Hans Hammerschmid on piano, Peter Trunk on bass and on drums Kenny Clarke, who had quit the Modern Jazz Quartet and moved to Paris. 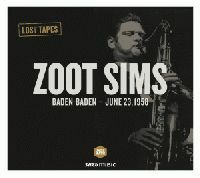 What you get with Zoot Sims in Baden-Baden is a single jam session in which each number features a different line-up and instrumentation: Sims and Koller on tenor sax get in the frame with All The Things You Are, before switching to clarinet for Minor Meeting For Two Clarinets. Sims' brilliant interpretations of Allen's Alley and Tangerine are met with the nimble, elegant ripostes of Koller’s Fallin' In Love and Brandt’s I Surrender Dear. Blue Night (featuring a six-piece horn section) is a number which beguilingly alternates between big band and ensemble jazz. The same goes for Open Door, in which Kenny Clarke urges the ensemble inexorably onwards with every bar, and the alto saxophone of Zoot Sims briefly opens the door to allow the sound of the day – bebop – to flood the studio.